The Royal Society for the Prevention of Accidents (RoSPA) have awarded NATS, the UK’s leading provider of air traffic control services, a Gold Medal for the seventh consecutive year. Through the RoSPA Awards scheme, which is recognised as the most sought-after accolade in the health and safety world, judges consider a businesses’ overarching occupational health and safety management systems. Along with their day-to-day activities, which include conducting rigorous risk assessments and incident logistics, NATS’ health and safety team have been recognised for their overall wellbeing strategy aimed at helping employees stay safe and well at home as well as in the workplace. As part of the campaign the team implemented a Stress Assessment to help employees identify and manage different types of pressure, and developed a Wellbeing Policy which includes a plan to provide training and toolkits for employees and line managers. Marie-Louise Chandler, Head of Health, Safety and Wellbeing at NATS, said: “We are very pleased to have been awarded another Gold Medal for our hard work improving health and safety throughout the organisation. Marie was presented with the award during a ceremony at the Excel centre in London on 19 June, whereby competitive awards went to the best entries in 24 industry sectors including construction, healthcare, transport and logistics, engineering, manufacturing and education. 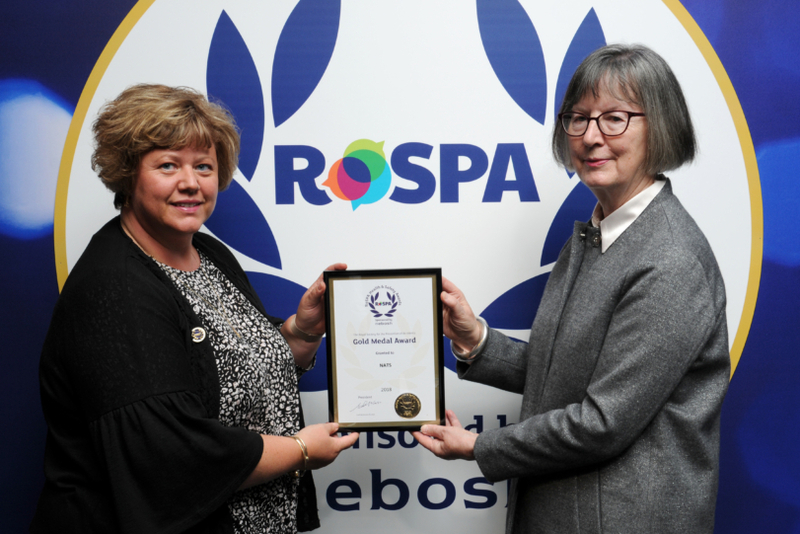 Pictured L-R: NATS’ Head of Health, Safety and Wellbeing, Marie-Louise Chandler, and Dr Mary O’Mahony, RoSPA Trustee with the award.